To Cite: Gharanizadeh K, Najd Mazhar F, Pezeshki S, Farjadnia M, Givechian B, et al. 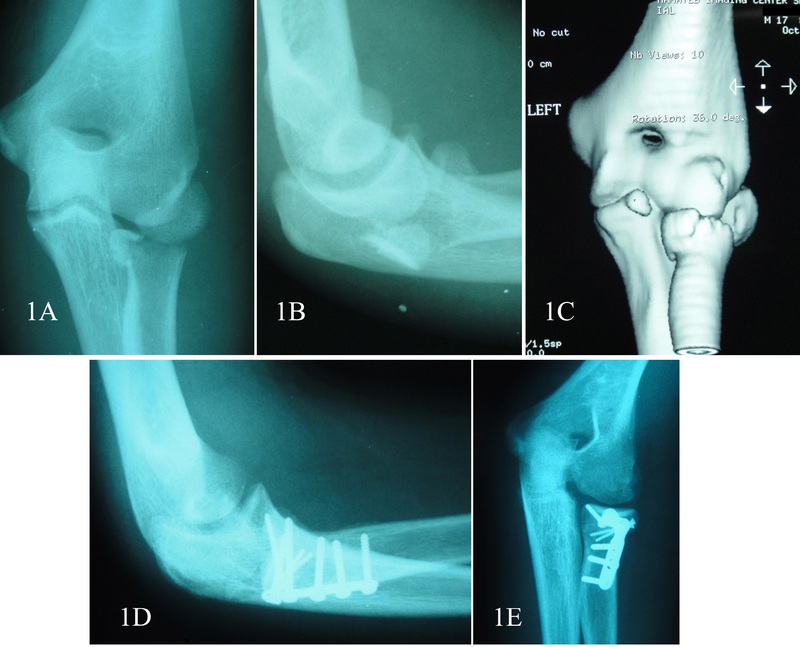 Surgical Approach to Posterior Dislocation of the Elbow Combined with Radial Head and Coronoid Fractures (Terrible Triad): Report of 19 Cases, Shafa Ortho J. 2014 ; 1(1):e43. Background: Terrible triad injury of the elbow has been a real challenge for surgeons. New standard methods of treatment have significantly improved outcomes, but yet complications occur frequently and rate of reoperation is still noticeable. Objectives: The current study aimed to denote improvement of current surgical techniques and help to minimize the subsequent complications of the elbow dislocation injuries. Materials and Methods: The outcomes of lateral surgical approach in 19 patients with terrible triad injury were evaluated through Mayo Elbow Performance Score (MEPS) and Disabilities of the Arm, Shoulder and Hand (DASH) score. Results: A concentric congruency was achieved for 18 cases. The average of MEPS was 87.11 ± 12.05. There-fore, 17 patients had excellent and good and two fair and poor results. Average of DASH score was 17 ± 13.83. Due to early postoperative dislocation joint stiffness occurred in one patient. Conclusions: In our experience, lateral approach provides an adequate view to access and reconstruct all stabilizing elements and could be considered as an acceptable option in terrible triad injury treatment. Isolated dislocation of elbow usually can be managed without serious complications. Nonetheless, when this dislocation is complicated with redial head and coronoid fractures (terrible triad), surgical management usually yields poor outcome (1). The terrible triad common postoperative consequences include elbow instability, early osteoarthritis and joint stiffness (2). Un-fortunately, most of victims with complex elbow dislocation are among active youths and faced with partial disability of elbow, imposed financial burdens and long term complications. Recent insight into biomechanical structure of elbow joint has evolved surgical protocols with respect to the surrounding structures which stabilize the elbow. Previous studies (3, 4) showed that the adherence to standard protocols, reconstruction of coronoid process and radial head and surrounding soft tissue yield more acceptable results. The terrible triad is uncommon; however, due to large number of patients referred to our center (i.e. Shafa Orthopedic Hospital), we could collect sufficient data to investigate the subject and report the outcomes. The current study aimed to denote improvement of current surgical techniques and help to minimize the subsequent complications of the elbow dislocation injuries. After receiving required ethical permissions, we retrospectively recruited data including medical records and radiographs of all patients who underwent surgical intervention for terrible triad injury from 2005 to 2009. The coronoid and radial head fractures were categorized according to ReganMorrey (5) and Mason-Johnston radiologic classifications (6), respectively. All operations were performed by two at-tending surgeons under general anesthesia and supine position. Direct lateral incision of the elbow was used and after dissecting the fascia, existed avulsion or rupture in the lateral collateral ligament (LCL) was expanded. When the ligament was intact, the Extensor Digitorum Communis (EDC) and the anterior one third of the lateral collateral ligament were longitudinally split and the lateral ulnar collateral ligament was pre-served. Hemarthrosis was evacuated and the joint was explored for debridement of crushed chondral fragments that were rather common on the humeral side. We used Tran’s osseous suture fixation to manage the coronoid fracture as described in O’Driscoll et al. study (6). Two holes were drilled on the coronoid fragment and a non-absorbable suture was passed through the fragment and the attached part of the anterior capsule. After making a small 2 cm incision over the ulnar metaphysis, two 2mm wide holes were drilled on the proximal posterior part of the ulna aiming to the base of coronoid process using “free hand technique”. Sutures were subsequently passed through the holes and held for later repair at the end of the surgery. It was planned to reconstruct all types of radial head fractures. 1.5, 2 and 2.7 mm mini fragment screws along with 2 and 2.7 mm miniplates were applied. T plate was used in cases with radial neck fractures or comminuted fractures. For type III radial head fracture we performed either resection or radial head arthroplasty to manage the fracture. We performed resection in three cases and radial head arthroplasty in one type III radial head fracture. A metal prosthesis (Evolve, Modular Radial Head System, Wright Medical Technology) was used in this case. In 90° of flexion, last step of tranosseous fixation of coronoid fragment and the at-tached part of anterior capsule were completed and the sutures were tied. Major part of the lateral collateral ligament was transosseously fixed on the footprint of its attachment site to the lateral epicondyle using nonabsorbable sutures. Finally, the stability of the elbow was assessed in pronation, taken through a flexion-extension arc of motion. In cases with severe soft tissue injury that entire soft tissue attachment was shaved from distal humerus, an anteroposterior whole was drilled on lateral margin of distal humerus and the facia of anterior and posterior compartments were intraosseously fixed to enhance the stability of the joint. A long arm splint was applied and the arm was positioned in 90°of flexion with the forearm in 45° pronation to protect the lateral collateral ligament (LCL). Postoperatively, all patients received 25 mg indomethacin three times a day for four weeks to prevent heterotopic ossification. The splint was usually removed between 3 to 4 weeks after surgery based on the severity of pain. Physical therapy exercises were started with active range of motion and continuous passive motion (CPM). The patients were then evaluated weekly for 6 weeks. Thereafter, they were assessed clinically and radio logically in 3rd, 6th, 9th, and 12th month and then yearly. At the last follow up visit, results of the surgery were assessed using Mayo Elbow Performance Score (MEPS) and Disabilities of the Arm, Shoulder and Hand “DASH” score. Radiography was used for evaluation of congruency state, appropriate reduction of elbow joint and union of radial head and coronoid process. Complications like hetero-topic ossification and re-dislocation or sub-luxation of the elbow joint were also radio-logically assessed. We obtained data of 19 skeletally mature patients (13 males and 6 females) with aver-age age of 32.16 (16-54) years. Fifteen patients were injured after a simple fall, two after a fall from height and two after motor-bike accident. There was a radial nerve injury in one case which recovered spontaneously after 12 weeks. No one had open wounds. The mean follow up period was 24.32 ± 11.09 months. According to Regan and Morrey category, we had 9 type I and 10 type II coronoid fractures. Sixteen cases were fixed transosseously via no absorbable sutures, two with screws and one with a 2mm mini-fragment palate. Based on the Mason classification, there were 3 type I, 7 type II and nine type III radial head fractures. In nine cases radial heads were fixed by mini-fragment 2 and 2.7mm T plates (Figure 1. A, B, C, D, and E). The screw was applied to fix 4 radial head fractures as the only fixation device. Two small type I fractures were conservatively managed. They were neither resected nor reconstructed. One fracture was managed by arthroplasty (Figure 2. A and B). The left three radial heads could not be re-stored and were resected. We could not per-form arthroplasty in these cases due to unavailability of prosthesis at the operation time. The mean flexion extension arc of the el elbow was 102.63° ± 33.22° (5° to 140°). The mean arc of pronation and supination were 60.53° ± 14.32° (40°-80°) and 60° ±13.72° (30°-80°), respectively. Union of all osseous structures was documented radio logically and concentric elbow joint restoration was achieved in all but one patient. The mean MEPS postoperatively was 87.11 ± 12.05 (55-100). Accordingly, 6 patients had excellent, 11 good, 1 fair and 1 poor results. Closed reduction of the elbow joint dislocation combined with radial head and coronoid process fractures is almost invariably disappointing (7-12). Three components in close interaction stabilize the elbow joint including: osseous articulation (especially radial head), capsuloligamentous complex and musculo tendinous units (12, 13). Longterm stability cannot be restored without reconstruction of these elements. In the study by Ring et al. (3) 5 out of 11 patients experienced redislocation after operative management, 3 experienced significant complications and the overall result of the management was rated as unsatisfactory. Heim et al. (4) noticed early onset arthrosis and residual instability in 8 of 11 patients with terrible triad injury. Joseffson et al. (5) also reported that all of their patients with terrible triad (four in their series), who underwent radial head resection experienced redislocation. Biomechanical knowledge about stabilizing elements of the elbow and mechanism of the injury has modified surgical protocols. Several studies demonstrated that radial head excision has been followed by posterior instability and recurrent poster laterally rotatory instability especially when other stabilizing elements are injured (13-16). Moreover, it has been revealed that the radial head has a main role in conduction of force from the hand to the humerus, and resection of the radial head in cadaveric simulation diminishes the valgus load resistance (15, 16). In 3 cases, after reconstruction of coronoid process, LCL and soft tissue of the distal part of the humerus (despite resecting the radial heads) and stability of the elbow joint were obtained. Fortunately, all of these patients regained excellent performance based on MEPS results. Other studies also found that the resection of the radial head in the presence of an intact anterior bundle of me-dial collateral ligament (MCL) has trivial effect on the elbow kinematics (17). A fundamental role for coronoid process and the anterior capsule especially in type I and II coronoid fractures is presumed. Fern et al. (18) in their study on cadavers showed that reconstruction of radial head and lateral collateral ligament would not prepare adequate stability if more than 50% of the coronoid process is fragmented and thus reconstruction of the coronoid for virus stability is essential. They also recommended that the type I and some type II coronoid fractures could be managed with only reconstruction of the lateral column structures (18). None-the less, some other researchers found minor fragmentation even more troublesome in terrible triad injury and emphasized on repairing small particles (3). In the current study, all coronoid fractures were repaired successfully, mostly transosseously with the application of no absorbable sutures. This method has been suggested in literature (3, 6, 19). Besides bony structures, ligaments also play an important role in stabilizing the el-bow joint. On special consideration in this setting is LCL, which encompasses three parts. These parts are in close interaction with each other and radial head provides rotatory stability of the elbow and thus residual insufficiency in this ligament leads to recurrent poster lateral rotatory instability (20). The researchers, who reconstructed both bony structures and LCL complex as well as capsular ruptures, reported significantly better outcomes. In a series by Pugh et al. (7), of 36 patients, 34 achieved concentric stability. They also reconstructed medial collateral ligaments in the presence of residual instability. They applied hinged external fixator when conventional repair yielded no sufficient joint stability. Eight of patients in this setting required reoperation (7). In the current study, the stability of the el-bow joint was restored in 18 patients’ with-out reconstruction of the MCL. The lateral incision solely provided an appropriate view to reconstruct all elements in standard protocol. Furthermore, the elbow joint stability was attained without hinged external fixator and thus probable ensuing complications were avoided. Based on the MEPS results, 89.4% of our operations was satisfactory and in association with Pugh et al. (7) study (82%). The rate of reoperation in our study compared with similar studies was significantly low (7, 8). Our finding was comparable and perhaps more promising than other studies’ that approached through a global incision for an extended view and used hinged fixator for restoration of concentric stability (21, 22). Despite the indomethacin was prescribed prophylactically in all cases, heterotopic ossification happened in two patients. This complication seems to be unproblematic by itself (7, 21). Our study limitations included small sample size and that two different surgeons operated the patients, which may have affected the results. Prospective study with long term follow up is recommended. Management of terrible triad seems demanding. The challenge exists in reconstruction of elbow joint stabilizers in one side and minimizing the surgical manipulation, invasive procedures to prevent further complications, and long term immobilization on the other side. In our experience, lateral window via an isolated lateral incision provides an adequate view to access the vital elements of stability and could be considered as the first choice in the absence of ulnar nerve injury.